For that much it better have real gold in there! I saw these in store and assumed that they were marked incorrectly. Craziness! That's absolutely insane. I'm sure there is some nut who will buy them at full price. Agreed they will go to markdown for a reduced price and even then they will not be worth it. Seeing something like this makes me glad I don't purchase as much as I used to. I completely agree. I just got the Let's Get Visible hoodie and vest for $79 and $59 respectively at the Warehouse sale. They're both well made, toasty warm and very reflective. I wasn't willing to pay $228 and $178 for them, and obviously neither were the majority of people. They went to WMTM, then to the Warehouse Sale and they hadn't sold out before they were taken down. I also have the black and white reflective Speed Tights and reflective Speed shorts. I got both on sale. It seems obvious to me that reflective items aren't selling at the higher price points. Not sure why a further increase (for a bunch of dots, not large reflective panels like the Let's Get Visible pieces) seems like a good idea to them. Never fear, if you like these you'll be able to get them for a much more reasonable price. It just requires some patience. Yet another reason not to support this company. Do they take us for fools? I am sorry but that price is outrageous. Like someone already said it, it better be threaded in gold. With sparkling diamonds too! I thought the pricing was an error. I really don't see anyone purchasing the items at those prices. @Deb - I totally agree. Time after time the reflective stuff goes to WMTM and yet these pieces were still priced insanely for stinking little dots, not even panels. The thing that kills me is the tights look like they have less dot material than the What the Sport short, since it only covers the lower calf, yet the premium is an additional $30 above the WTS short premium. It really makes no sense. Ha! That's ridiculous. $168 for 1 piece of clothing, no thanks. LLA, I think there will be people that buy it. Think about all the celebrities that are wearing lulu, plus all other people with lots of money. so the company will make some money. then the products end up in WMMT where it will reflect it's true cost. people will buy it because it is on sale, right?! no matter what, lulu still makes money. It's too bad really. The dots are pretty cute. If they were only like $10 more than regular prices, then they'd probably sell out. And I'm guess Lulu would sti;; make a decent profit with a $10 mark up. The reflective dots probably cost a dollar to add on to the regular design. Hey LLA--chiming in from the educator perspective. Saw the shorts. Team was surprised/outraged/shocked. I told manager that I couldn't in good conscience educate on these shorts' price point, given that I myself had no idea what this reasoning was. I was also totally transparent and said that to guests--that we weren't quite sure why the shorts were labelled and ringing up at $98, but that we'd look into it. This weekend, we saw that the website had them at $58--we went and repriced all of these shorts to $58 accordingly, and were careful when ringing up to change the price. We sent a message to corporate about this as well. Had no idea the online changed price to $98 now. Ridiculous. I 100% do not support this. An extra $10 charge I would--begrudgingly--get. Okay, it's $10 more, but arguably its higher value. $40 more? Enough for a full length pair of pants? That's out of control. To the anon saying they rang up at $58...not sure about that. They were consistently ringing up at $98 at my store. UNLESS this is a new change in the past 48 hours. @MB - maybe they will reprice them. I know it's happened a few times fairly quickly once they saw a new piece not moving. I just can't fathom what justifies the enormous upcharge on these. I only ever saw the shorts priced at $98. The website pricing on the Picnic Play dress has been bouncing around between $98 and $118 a couple of times now. Eric, that's exactly what I was saying! maybe this is the new lulu strategy. first release an item at shocking price, then 'mark it down' to regular price and sell it on WMTM and everyone goes crazy to buy it. did you guys see that meme on pinterest. dress for $50, reaction: nah. dress for $150, on sale for $50, reaction: buy!!!! Guess lulu saw it too. Does anyone know what shoes the model is wearing? I've been meaning to ask for ages.... Thanks!! Last week, when the WTS reflective shorts uploaded, I bought them at the $58 price point. They are my favorite shorts for running the trails and I have them in almost every color/print. So as soon as a new color/print comes out, I snag it. 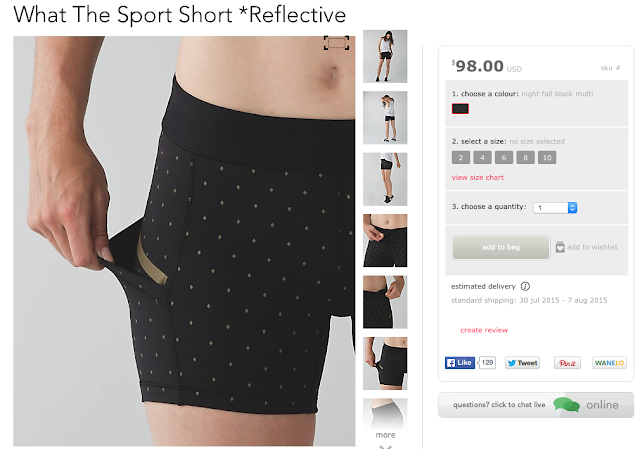 Fast forward a few days, I noticed they moved the reflective shorts to its own page and the price increased! So happy I got them at the $58 price point, cause there is no way I would pay over $100 after taxes for shorts. Also, the reflective is just a print, not reflective fabric. There really is no reason they should cost $40 more. @ Anon 6:28pm, you mean the ones the model has on in the 7/8 tight pics? Those are Asics Gel Fit Sanas. @Eric and @ anon 1:43 pm- I absolutely agree. The recent maintenance on Lulu has seen the addition of estimated shipping times per item – yet it seems that my orders now take longer to arrive…and for WMTM each item has added the “original price” to compare to the "markdown" I guess to make us feel like we are getting a steal. Also, I have noticed for leggings/pants on regular-priced items, the price used to be $88 to $92 but now has increased to $102. Very sly indeed. i love the what the sport shorts, they are my favorite run,sail and yoga shorts, sometimes I swim in them. I absolutely love the reflective pattern, but here is no way I will pay that kind of money for some nylon. I hope they change the price to the normal$58 which is pretty high as it is already. Though I agree that $100 for shorts and nearly $175 for pants is ridiculous, but to be fair....you all (and me too!!!!) shop at LLL. It's not exactly budget shopping even at WMTM prices. @ anon 4:29 pm - lululemon is expensive but the prices on these two pieces are just nuts and seem really unjustified for some reflective dots. I know CW-X tights are up in the $170 range but you're getting some really nice, and from what I've heard effective, support technology in them. This isn't the case. LOL! I'm one of those dummies that bought the reflective bra and speed shorts last year at full price (they subsequently got marked way down). I also was an idiot and bought that down jacket with the hood at full price (almost $200) that there were a ton of in my size at the last warehouse sale (in that blue camo print) at less than half of what I paid. So yeah, Lulu gambles on idiots like me all the time, lol! I am trying to be more patient and smarter now, but it is hard! The shorts and bra worked great for my night leg at a Ragnar Relay this summer. The downside was a friend on another team was gunning for me and he could see me a mile away before he passed me, lol! Thanks Luluaddict for all your work on this blog! It's my fav! The pedal to the medal tight is priced normally, $145 in NZ. For comparison, patterned Insipres are the same price.